Devprayag: - Devprayag is situated at the altitude of 1978 ft above from the sea level in the Tehri Garhwal Districts of Uttarakhand State. The Devprayag is the confluence of the river Bhagirathi and Alaknanda. Devprayag is the Last Prayag after the confluence of Bhagirathi and Alaknanda Rivers, the River is becomes Ganga River. Devprayag is lies between the Rishikesh and Badrinath Highway. Devprayag is one of the most sacred places in Uttarakhand. The Ancient name of Devprayag is Gosthal or Devthirath. By the legends this place is the bath place of Hindu Gods. You can see there a very big temple of Lord Shiva in the route of Devprayag. It is visited any time of the year. Distance from Rishikesh is 77 km. Rudraprayag: - Rudraprayag is another Prayag. Rudraprayag is the confluence of the two rivers Mandakini and Alaknanda. It is said that Lord Shiva blessed the Devrishi Narad at this place in the Rudra Avatar. Rudraprayag is a hill station situated at the elevation of 1950 ft above from the sea level. Rudraprayag is also a very sacred place. Two routes are divided from here for Kedarnath and Badrinath. Rudraprayag is well connected through roads transport. The nearest train station is Rishikesh and the distance between rishikesh and Rudraprayag is 135 km. Karanprayag: - Karanprayag is situated at the elevation of 2520 ft above from the sea level. It is confluence of the sacred rivers Alaknanda and Pinder. The Pinder River is come from Pindari Glacier. 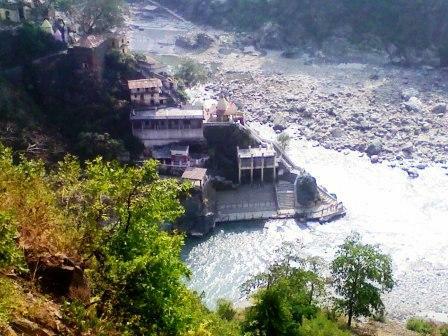 It is said that Karanprayag is the place where Lord Surya gives his kwacha and Kundal to Karna. Karanprayag is also a good city in the hills where you can buy everything of needs. The distance between Karanprayag and Rudraprayag is 32 km. Nandprayag: - Nandprayag is situated at the elevation of 2925 ft above from the sea level in the Chamoli district of Uttarakhand state. Nandprayag is confluence of the rivers Nandakini and Alaknanda. It is 21 km far from Karanprayag, in the route of Badrinath Dham. The famous temple of Gopal Ji is situated here. Vishnuprayag: - Vishnuprayag is situated at the elevation of 1372 mts above from the sea level. It is the confluence of rivers Dhauli Ganga and Alaknanda. It is located in the route of Shri Badrinath Ji; distance from Vishnuprayag to Joshimath is only 12 km.